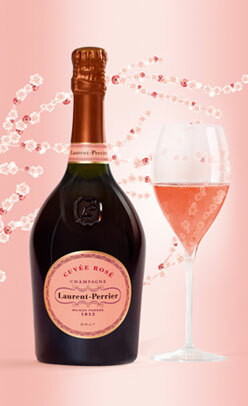 Laurent Perrier Brut Rose Champagne…Sultry delight! There is nothing better than popping open a great bottle of Rose before dinner or as an apertif. Laurent Perrrier Brut Rose has been my personal favorite Rose for years. A very competitive price for a Rose. Made with 100 % Pinot Noir grapes, aged in cellars for at least four years. This is the best selling Rose in the world. With such an aromatic character, salmon pink in color, the most elegant silky bubbly Champagne filled with strawberries, black cherries and well-defined. This Rose just has a way of making me so very happy. Hard to describe the sensation I get when drinking. My husband will buy it for me when he wants to put a smile on my face. For years I have suggested it while working in various wine boutique’s and every single customer loves it. This Rose has been around for over 40 years and I raise my glass for 40 more years of quality and excellence. Sultry sexiness with bubbles! Perfect for summertime, so refereshing and crisp! Pairs great with raw fish, charcuterie, and red fruit desserts. This entry was posted in Champagne, France, Highly Rated and tagged apertif, Champagne, France, Rose Champagne. Bookmark the permalink. 2 Responses to Laurent Perrier Brut Rose Champagne…Sultry delight!